If you’ve had a night out in Wellington at any time over the course of the past two decades, chances are you’ve spent a few hours taking in the sights and sounds of Courtenay Place. It’s essentially a quarter mile strip of bars and clubs of just about every conceivable description – a veritable playground of dancing, drunkenness, and debauchery right through to the wee small hours. It’s seldom a pleasant experience for anyone with their sensible head screwed on, but it does stand as a marker for just how much Wellington nightlife has changed over the past quarter of a century. Late night partying has to a large extent become a mainstream pastime, and most weekends these dens of hedonism are full-to-overflowing. It wasn’t always this way. Prior to the late 1980s and early 1990s, when Courtenay Place underwent major redevelopment, “nightclubbing” in Wellington was a far more intimate experience. By 1978 disco and “dance music” had started to populate the local charts, and club owners were taking note. Rewind to the late 1970s, and our story begins with the arrival of disco to these shores. Prior to this, Wellington nightlife amounted to cabaret, dine and dance, live bands, and a vibrant red light scene. Pubs like the Terminus, the Cricketers, and the Clyde Quay were all popular live venues of the era, as was the Courtenay Place-based Last Resort. All played regular host to any number of touring bands passing through the capital. 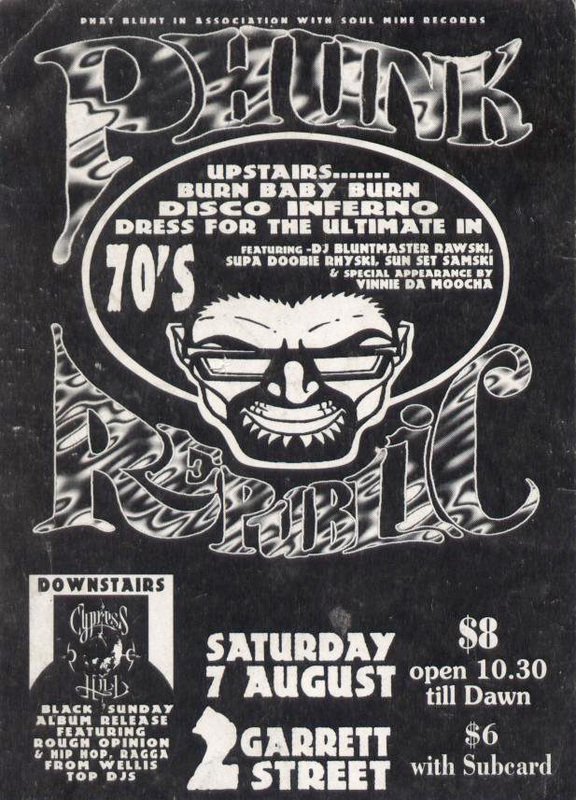 And while the leading “mainstream” nightclubs of the early to mid 1970s – the likes of Ali Baba’s on Cuba Street (aka the Cave), Slack Alice on Plimmer Steps, and Ziggy’s (formerly the Downtown) – continued to operate primarily as live venues for resident bands, by 1978 disco and “dance music” had started to populate the local charts, and club owners were taking note. Cue the emergence on the scene of three key men who would change the face of clubbing in Wellington through the 80s: Ray Johns, who had already served what amounted to an apprenticeship by running bars/venues like The Cabin and Albert’s Attic; Nick Mills, who was a youthful but very ambitious manager at the Phil Warren-owned Slack Alice; and Tony Pene or ‘Tee Pee’ as he became better known, a hugely influential DJ who would wind up working for both men as the decade progressed. 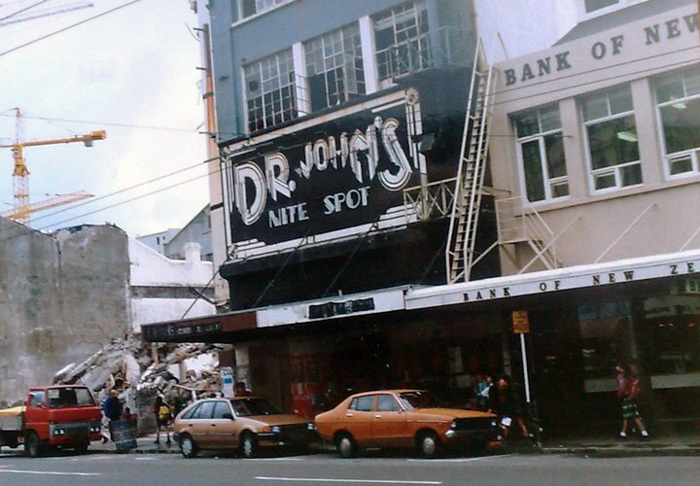 Let’s start with Johns, and at this point it’s worth noting that as the 70s morphed into the 80s, Courtenay Place was a rundown area, a ramshackle zone consisting mostly of greasy takeaway bars and a collection of litter-strewn bus shelters which housed many of the city’s homeless. 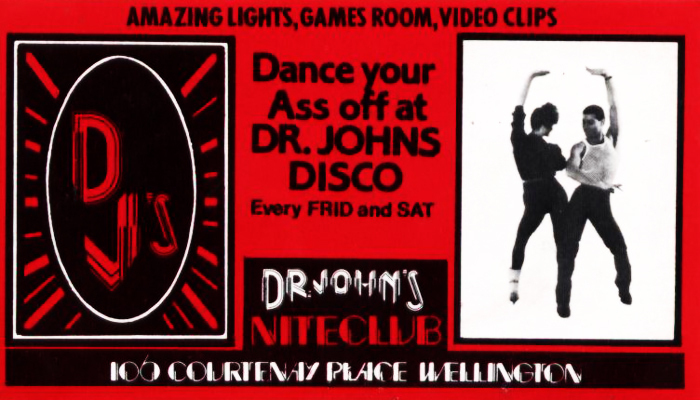 But it was also home to Dr John's, a late night disco run by Johns himself, and an important nightspot in the evolution of clubbing in Wellington. 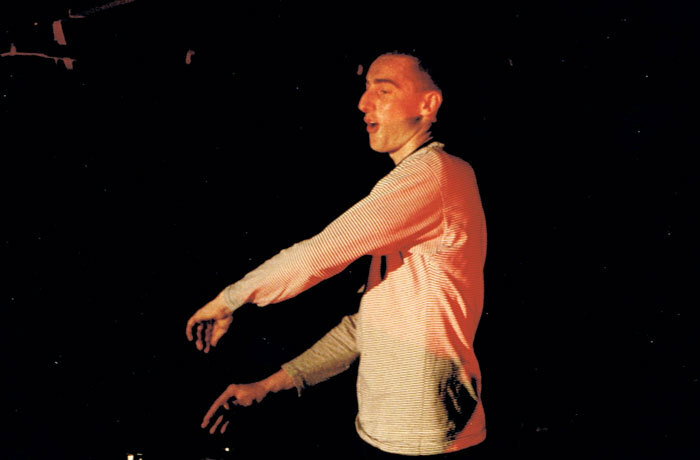 It's where Pene began learning his trade "around 1980" and it's also where another pivotal figure – Rhys Bell (aka DJ Rhys B) – would learn his chops later in the decade, firstly as understudy to Pene, and later, as DJ in his own right. Johns had other interests, not only was he an avid football supporter and a local wrestling promoter of some renown, he also had Spats, a more upmarket club, located on the corner of Victoria and Harris streets – at the premises formerly known as Carmen's Balcony. For the uninitiated, or anyone living on planet zog at the time, Carmen (aka Trevor Rupe) was a Wellington LGBT community icon, and a onetime mayoral candidate. Spats was fairly conservative, even by Wellington standards, and it always seemed to be having liquor promo or theme nights. But it had its own set of regulars – Johns inspired nothing if not loyalty – and appealed to what might best be described as a “Top 40 crowd”. The most memorable DJ of its time was one “Moondog” Mark, who also had a stint at Dr John's. “Moondog” has become an almost mythical figure in Wellington DJ circles, and someone Pene credits as an inspiration and a big influence on his own career. Managed by long-time Johns employee Heather Com, Spats also had a resident band for a period, and it out-lived Dr John's, which pulled the plug around 1986. Ultimately though, Johns had other ideas, bigger plans, and I’ll come back to those. Meanwhile, less than half a mile down the road, at the foot of the golden mile, halfway up Plimmer Steps, 21-year-old Nick Mills was getting busy, buying Slack Alice – in instalments – from his high profile employer, Auckland entrepreneur Phil Warren. It wasn’t long before Slack Alice became Exchequers (via a short tenure as the Night Site), a fully-fledged nightclub. It had two bars, a large dancefloor, plenty of seating around the periphery, lots of chrome, and far too many mirrors. I also recall it for often being a little over zealous on the dry ice. Pene could rap, making him the capital’s first genuine MC, and his record collection was the best in town. By 1985, Exchequers was the city’s most popular club, Pene having made the move from Dr John's. Pene could rap, making him the capital’s first genuine MC, and his record collection was the best in town. Early on in his Exchequers tenure, Mills sent Pene to the US to pick up tips and learn from the best, and more generally, as “Tee Pee”, Pene had an unprecedented profile for a local DJ. 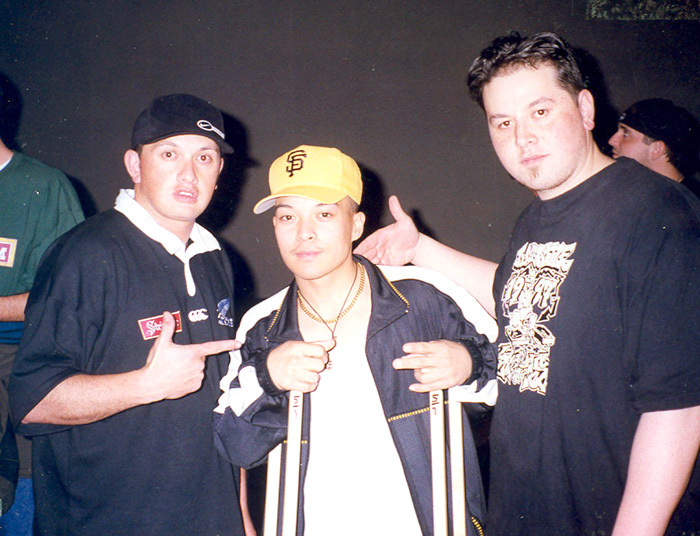 Along with regular radio advertising work, Pene appeared on national television at one point, charged with explaining this newfangled thing called hip-hop to the masses. Sending Pene to the States had been a brave move. 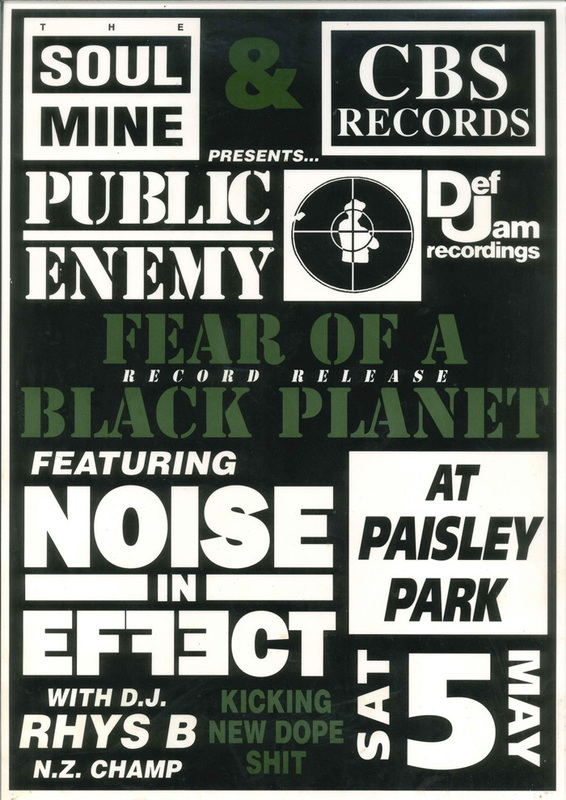 Remember this was the mid 80s, DJ or hip-hop culture back then was not what it is today, so for Mills to make that sort of investment in his primary employee was either very forward thinking, or an all too obvious no brainer. Mills was rewarded with roughly four years of committed service, and by the time Pene left for the States permanently late in the decade, Exchequers was more or less a brand, and Mills was sugardaddy to the best basketball team in the country. But like Johns, Mills too, had other plans … and I’ll get back to both a little later. 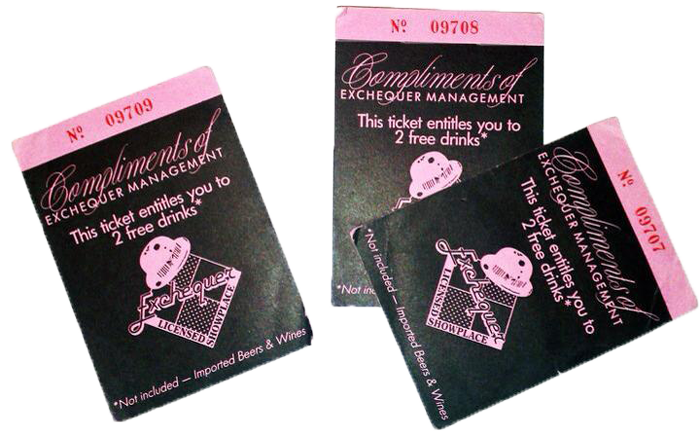 With The Palace, Exchequers was also host to the best regular Thursday (night) of the decade. The Palace was the brainchild of two guys from Downstage Theatre – Tony Stanley and Andrew Thomas, and it embraced the trend of the one-off "independent" nights which were proving so successful in the UK at the time. Mills conceded that Thursday was "a funny night", and in 1987 The Palace took Wellington nightlife by storm, reportedly attracting some 600 patrons to its opening night in January of that year – on a Thursday night! Indeed, the venue's air conditioning failed that hot summer night, and from all accounts the club resembled a sauna – one with 600 people vying for breathing space. Initially Mike Daly was The Palace DJ, but eventually the hugely underrated Matt Poppelwell took over. 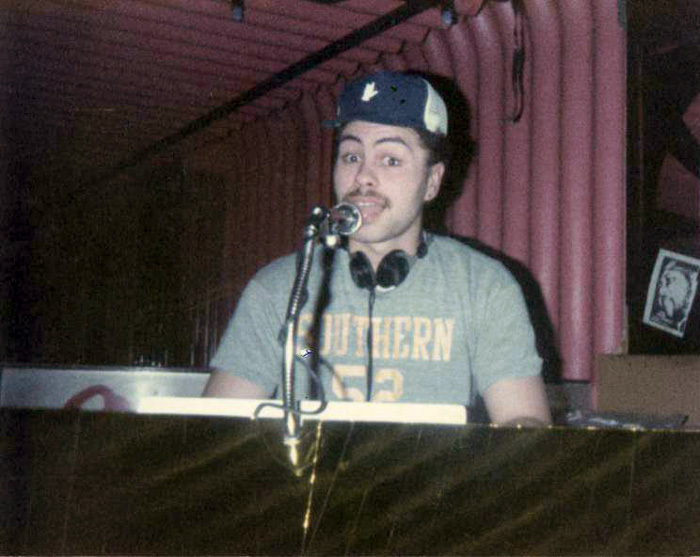 Poppelwell – who can be found today at the popular retro-disco, Boogie Wonderland – would also DJ, along with a fresh young talent called Clinton Smiley, at the next regular Thursday night of note – the Sub Club in 1989. 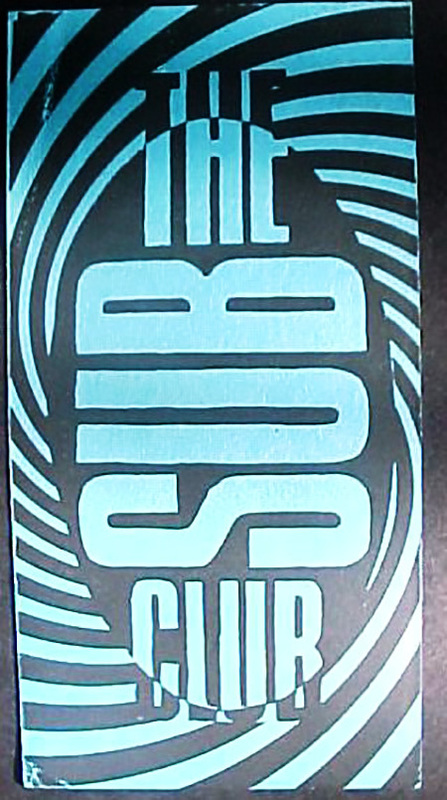 The Sub Club was upstairs in "the cave", ex Ali Baba's, on Cuba Street (now San Francisco Bath House), and it not only heralded the arrival of techno on Wellington dancefloors, it also acted as a precursor to the much loved Naked Angel “club” of 1991/1992. But I’m getting a little ahead of myself, so more on that later. 1981: Rob Muldoon is (almost inconceivably) given a third term as Prime Minister, Dave McArtney’s Pink Flamingos dominate the NZ Music Awards, and hundreds of Kiwis attend Nambassa and Sweetwaters 2. And of course there was that other thing … the tour to end all tours. We know what Johns and Mills were doing at this point, and the success of those ventures had stirred the interest of others. People like Geoff Turner, who initially adopted a restaurant/old style cabaret combo for his club Chips, which was located at Willis St Village. After entering the fast developing nightclub scene in early 1981, Turner’s old school approach didn’t last long, and by 1983 Chips was morphing into a disco-orientated club like the rest. Frankie Stevens – future NZ Idol judge, brother of hitmaker Jon Stevens, and a performer in his own right – managed (or partially owned) Chips for the bulk of its existence. Stevens also performed DJ duties for a while, but more generally Chips dabbled with the live music format for longer than might have been considered wise. Like Spats, Chips also survived against the odds for a full decade, if not actually a little longer. It too had its own regulars, and there was that novel thing with the drinks; you bought chips upon arrival and used them as drink tokens as the night progressed. Chips had a big share of the midweek-office-worker market, and I’ll say no more. More significantly, 1981 also signalled the tentative arrival of the club that would go on to become the most fashionable of the decade, Clares. Although it would take another four years before it really took off. But when it did, for a full five years across the late 1980s through to 1991, Clares became a DJ-nursery quite unlike any other. Set up by the Sampson brothers (Henry and Robbie) and Kevin Bull, Clares was located on Garrett Street, just off Cuba Street. Initially it was a Friday night only affair, located in an upstairs “lounge” setting, until around late 1984/1985 when the club was expanded, and a downstairs bar and dancefloor added. 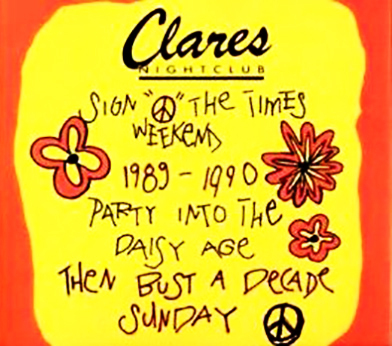 Clares wasn’t necessarily the most popular club (see Exchequers), but it definitely had the most fashion-conscious and committed regulars, and it quickly became the place to be seen. 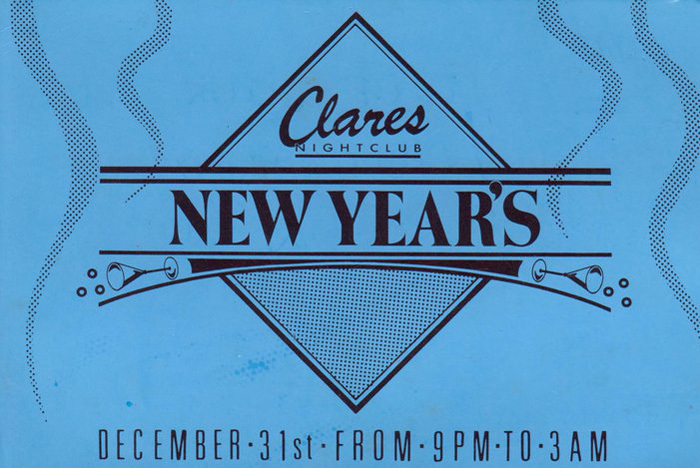 Things never really got started at Clares until well after 1am, usually peaking sometime closer to 3am. There were “licensing issues” at one point, and the club mysteriously changed hands (rumours were rife as to the reasons why) around the same time as the expansion. Lewis Paddon was an excellent manager (and doorman) for the bulk of its lifetime, and between 1987 and 1990, Clares was often humming on two levels with the wonderful Six Volts (band) playing in the upstairs lounge, while downstairs a procession of talented DJs (over that three-year period) were introducing the house sound of Chicago and the hip-hop flavours of NYC to a fully engaged set of regulars. DJs who played downstairs at Clares post-1985 included: John Blomfield, Matt Poppelwell (ex The Palace), Koa Williams, Gerhard Pierard, Steve Hill AKA Stevie B, DJ Crispy Fresh, Ian Seumanu AKA DJ Raw, and the aforementioned Rhys B, who went on to compete at the global DMC event after winning the New Zealand DMC champs in 1990. 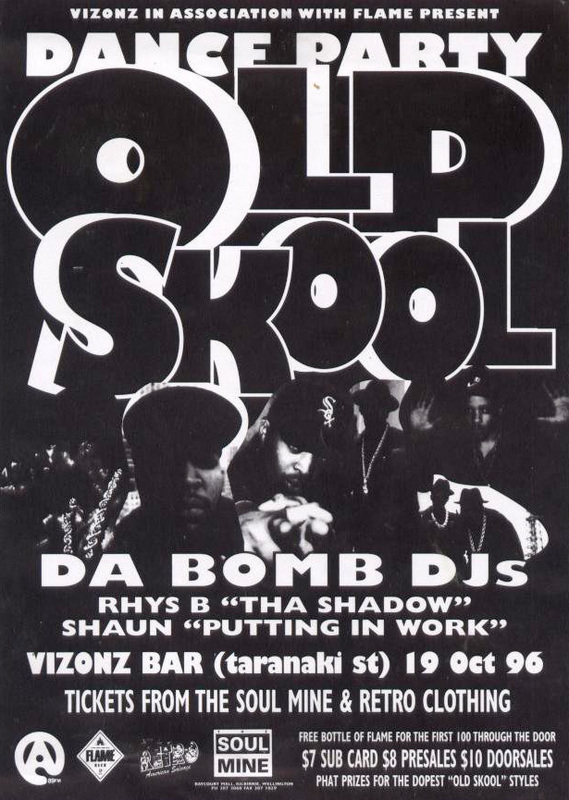 Around late 1989/ early 1990, the club also heralded the arrival of Jason Harding, AKA Clinton Smiley, a young DJ whose name would go on to become synonymous with clubbing in Wellington through the 90s and early years of the New Millennium. There was only one DJ booth at Clares, and with all these young motivated DJ-types on the scene, other venues and clubs naturally started to emerge. 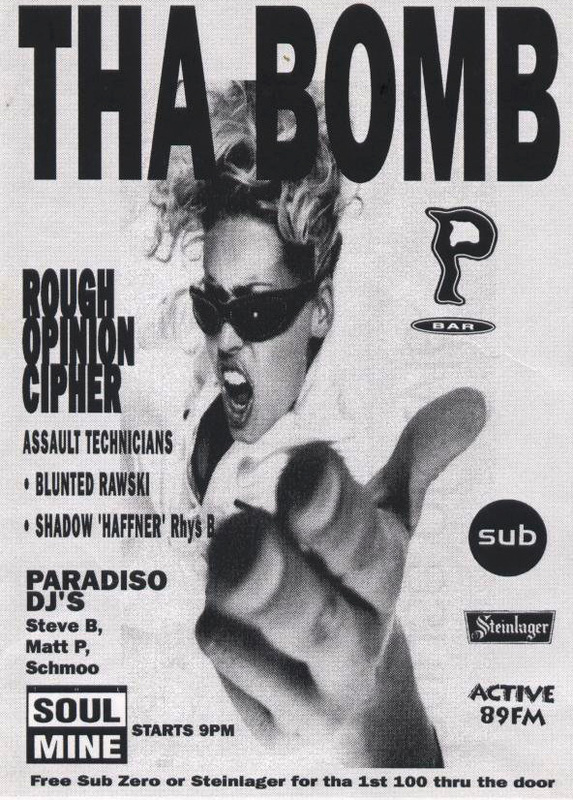 The club’s demise came about in 1991, perhaps early 1992, when a new warehouse party culture emerged. Inevitably, having been a nursery for DJ talent, Clares had inadvertently contributed to its own downfall; there was only one DJ booth at Clares, and with all these young motivated DJ-types on the scene, other venues and clubs naturally started to emerge. It was also the case that Clares had simply reached its allotted use-by date, and had stopped attracting the most fashionable crowd. There was a brief attempt to revive the venue when on Queen’s Birthday weekend 1993 it re-opened under the guise of The Tempest, but even the esteemed Rhys B was unable to breathe fresh life back into the club. 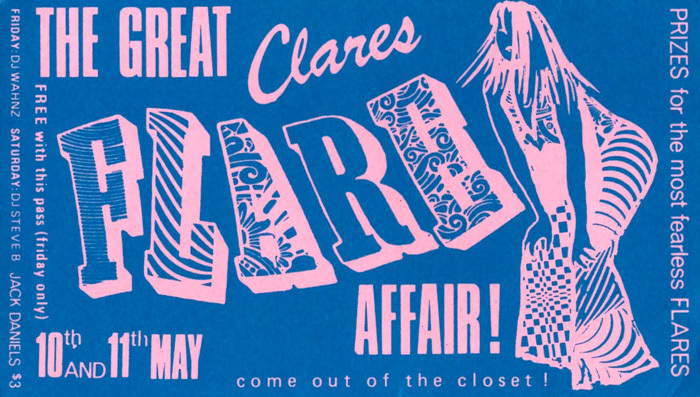 In its pomp, Clares was probably the closest Wellington came to emulating the vibrant Auckland club scene in terms of fashion and music. I think the capital suffered from something of an inferiority complex for most of the decade with everything always seemingly brighter and bigger in Auckland. The Auckland scene was certainly a lot quicker to embrace overseas trends, and of course it also had a much larger population base to draw from. 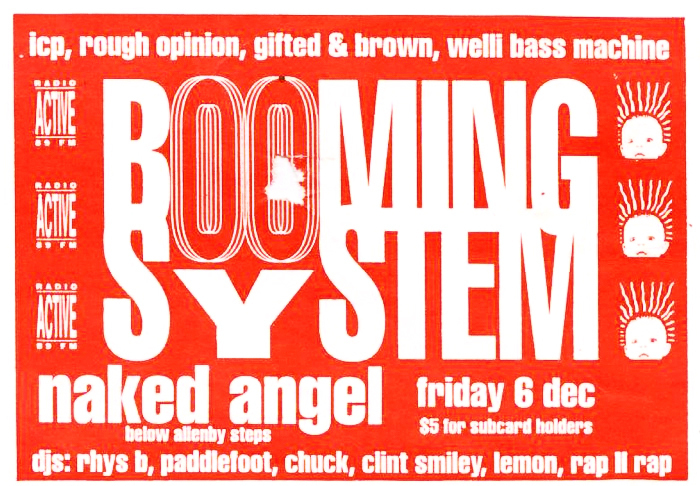 It’s also fair to say that the establishment of Naked Angel in 1991 fast-tracked the end of Clares. Naked Angel was set up by Dave Anderson and Paul Knowsley at an unusual but very spacious multi-roomed premises on Allenby Terrace (off Boulcott Street and a little off the beaten track). With Clinton Smiley behind the decks, Naked Angel emerged from the ashes of the popular Thursday night Sub Club (itself a Palace spin-off), and it quickly became the new “scene” in town. 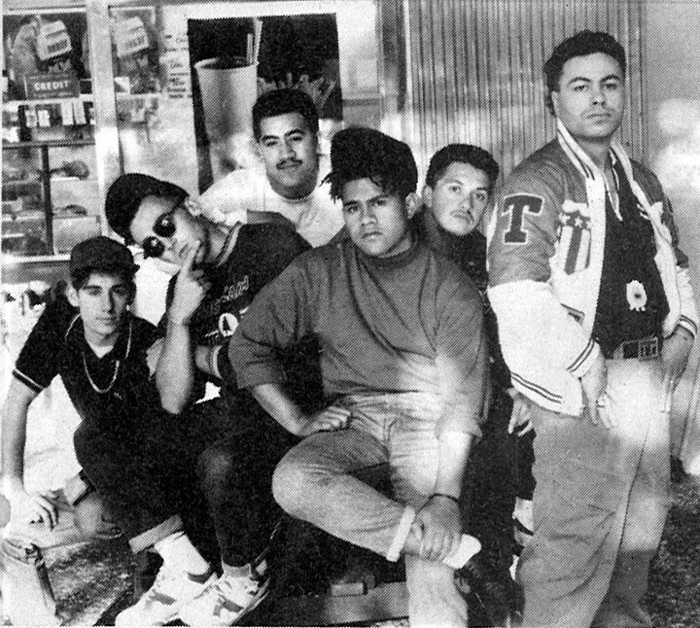 The most mainstream club of the era – even more so than Spats or Chips – was Candyo’s, which endured a turbulent tenure at the Mid City complex through the latter part of the decade. Owned by Martin Pugh (future financial "advisor" to David Tua), Candyo’s was that most peculiar of beasts – a chain club, a brand, the McDonald's of clubland. Other Candyo’s were located in Tauranga, Hamilton, and Lower Hutt, and while the Hutt-based club did well enough, the Mid City venture was a latecomer and had no real point of difference in an already catered for market. Despite a bad flood shortly after it opened in 1987, and some adverse publicity over an assault outside the club (involving its doormen), the first 12 months were probably its most successful – under the stewardship of Ian Fine, during which time the DJ was one "DJ Liz" (or Lizard). 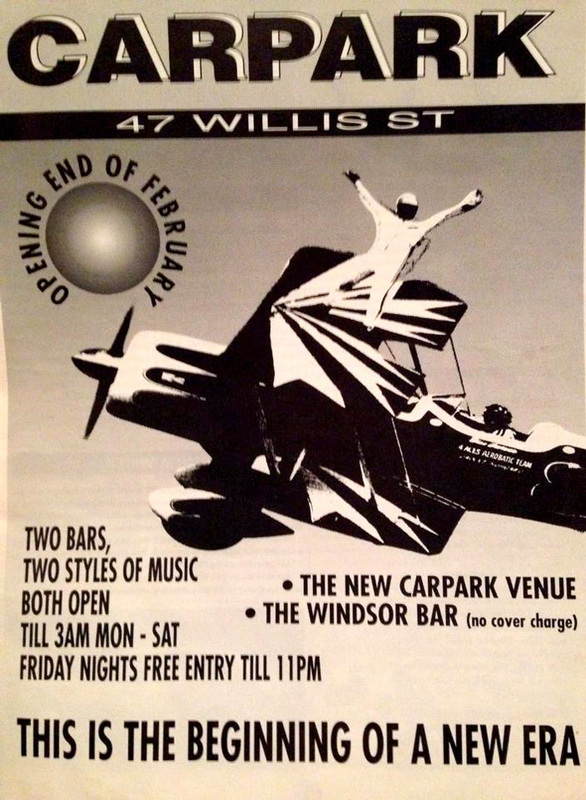 Another very popular late nightspot as the 80s rolled into the 90s was the Carpark on Willis Street. Owned and operated by Sean Murrie – now better known as the co-founder of Tuatara Brewery – the Carpark adopted an old school live venue approach, quickly establishing itself as the capital's premier late night destination for followers of live music. By the late 90s it had become the equally popular Malthouse, which was less rock and roll, and more corporate after-work-drinks, but for a few years there at the turn of the decade the venue became something of a throwback, playing host to some ridiculously good gigs in a short period of time. Before we return to the all new adventures of Johns and Mills, no overview of Wellington's nightlife in the 80s would be complete without looking at the LGBT scene. The homosexual law reform of 1986 gave the wider scene a lot more transparency than ever before, and was arguably the catalyst for the opening of Alfies in 1987 – following on from the successful Auckland venture of the same name. Established by Out! empire stalwarts Brett Sheppard and Tony Katavich, Alfies was located at an upstairs premises on Dixon Street, just off Cuba Mall. The aforementioned Carmen was flown in from Sydney to officially open the club, and it quickly proved a popular destination for not only the LGBT community, but anyone who liked to party extra late – the club always seemed to be raging well into the wee small hours, long after every other venue had closed (even Clares). Prior to Alfies, other nightspots for the scene included the long established Dorian club, and the Bamboo Bar in the Oaks complex. To a large extent, Alfies was an important precursor to the success of the hugely popular Devotion shed parties of 1992 to 1994. The club closed in 1994, with the premises eventually becoming the infamous Barney’s. By the end of the 80s, irregular “one-off” nights (often midweek) were becoming increasingly popular, and it was around this time that even hitherto unfashionable Chips got in on the act, hosting the Love Factory, an irreverent and fun night of comedy and music put on by the (student) Radio Active crew. 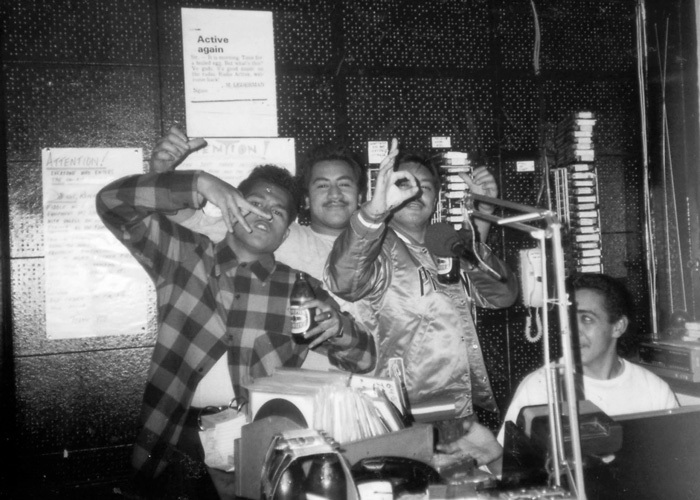 In fact, Radio Active played an important role in the development of DJ and club culture in Wellington right through the 80s – hosting the popular Uncut Funk show, which nurtured the talents of Tee Pee, Rhys B, and Clinton Smiley at various junctures across the decade. More generally the club scene had changed markedly from the one we identified at the start of the decade. 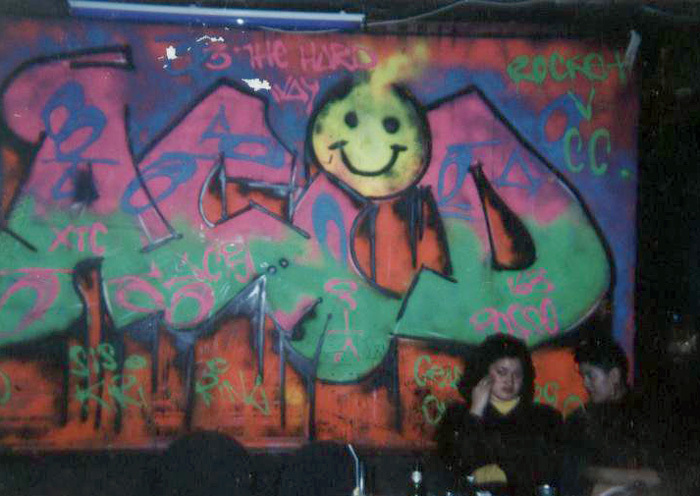 Ever more frequent “warehouse”/shed parties, and less formal arrangements like Naked Angel claimed a much larger share of the nightlife market than the traditional club format – none of the capital's key clubs of the 80s continued as going concerns very far into the following decade. 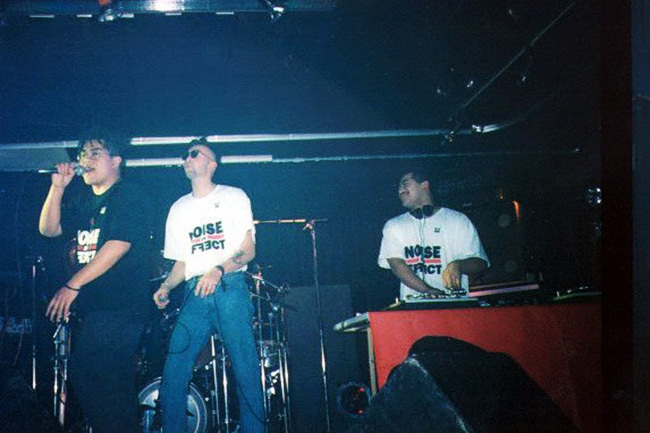 DJ culture was evolving at a rapid rate, live collectives were being formed – including Noise in Effect and Roots Foundation – and nightlife as we knew it was changing forever. Those changes, the sharemarket crash of 1987, which begat the eventual collapse of inner city landlords like Chase Corporation, plus the easing of late night licensing regulations for pubs, meant "clubs" as we knew them were faced with a challenging new reality. Certainly new projects for Johns and Mills appeared outdated, if not fatally flawed from the outset. Neither man could be accused of lacking ambition. 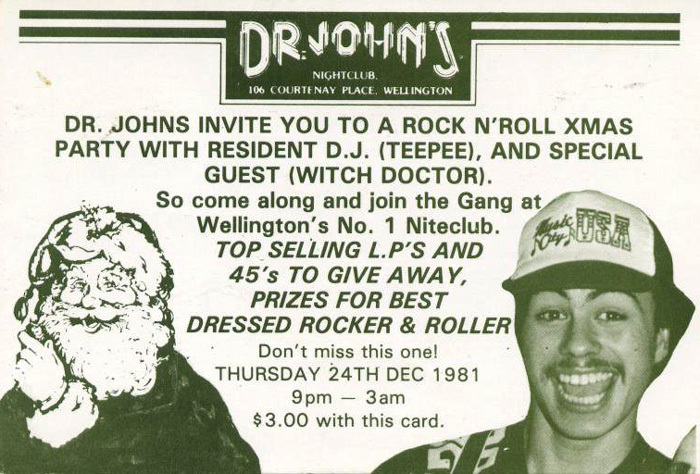 For Johns that meant the establishment of Arena on Wakefield Street, as unquestionably the most upmarket club Wellington had ever seen (to that point). 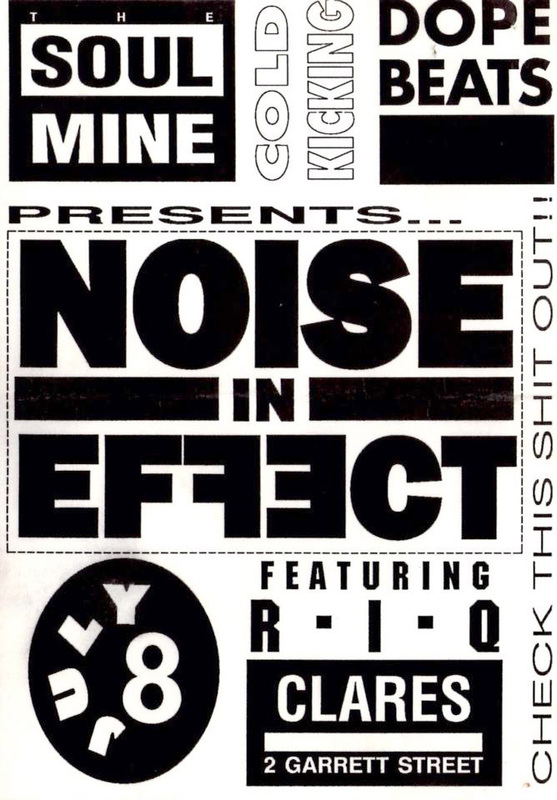 At the same time, Mills was in the process of setting up Metro at Mid City, his own expensive vision of what nightclubbing in Wellington should look like in the early 90s. Mid City proved a problematic and ill-fated location for the Metro venture, and the collapse of Chase meant Mills wound up sinking far too much of his own cash into a premises that always lacked the “wow” factor for a new generation of club patron. 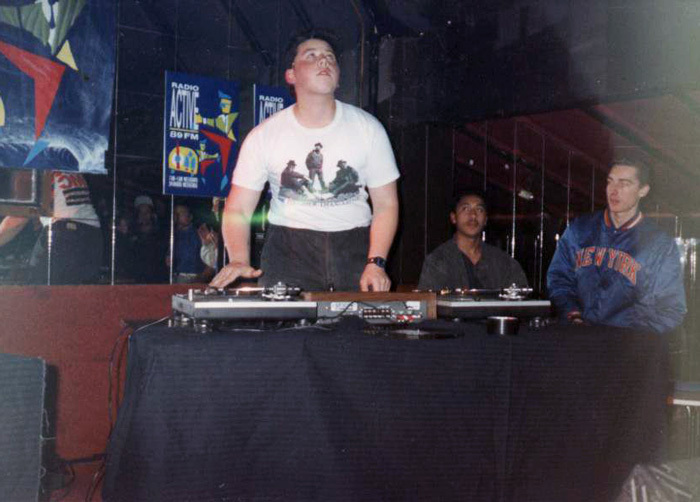 It did however have state of the art sound, and the club featured and co-featured several of the city's top DJs over the course of its life. Ultimately though, Metro proved a step too far for Mills, and it ended up costing him the small fortune he'd spent much of the previous decade accumulating. 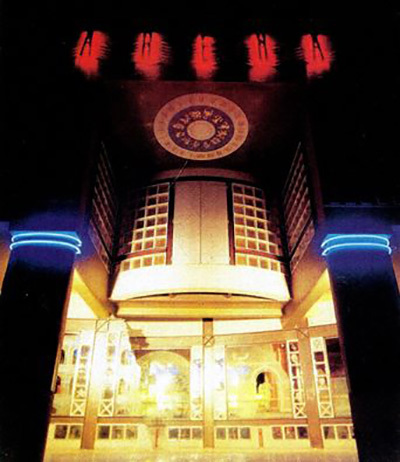 Arena opened to much fanfare in 1989, heralding itself on a nightly basis via an unmissable beam of light (from a super powerful spotlight) penetrating the night sky high above the club's Wakefield Street location. Lush surrounds, great sound, and no small amount of curiosity ensured the club did well enough to establish a buzzing scene of its own during the early part of the new decade. The music at Arena was always quite conservative, but from all accounts DJ Robbie Stephens – who enjoyed perhaps the longest tenure at the club – was highly regarded and very popular with the club’s regulars. But that opening rush of relative success amounted to little more than a honeymoon period for Johns, and Arena was never going to be sustainable while old style disco-clubs continued to lose large chunks of an already falling market share. The liberalisation of our liquor laws ensured that while more people were out partying, the way they were partying had moved away from the traditional club formats of a decade prior. So despite being state of the art, Arena was already old school compared to the increasing number of stylish new late night bars popping up across the city; the bohemian Cuba Cuba; ESC, which was a forerunner to Edward Street becoming a popular spot for all manner of late night revelry later in the 90s; Sol in the Oaks complex, which would later morph into La Luna. 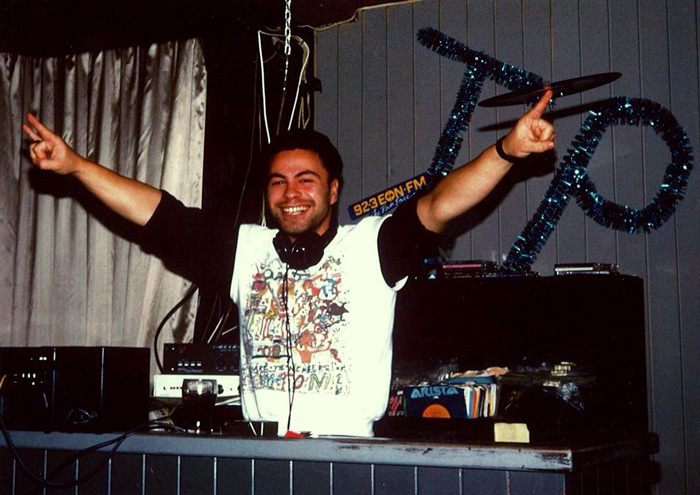 In keeping with the ongoing redevelopment of Courtenay Place, there was also Ecstasy Plus, which signalled the flamboyant arrival of Terry Serepisos on Wellington's party circuit. For most of 1992, Ecstasy Plus (“E plus”) ruled the capital's burgeoning late night strip. 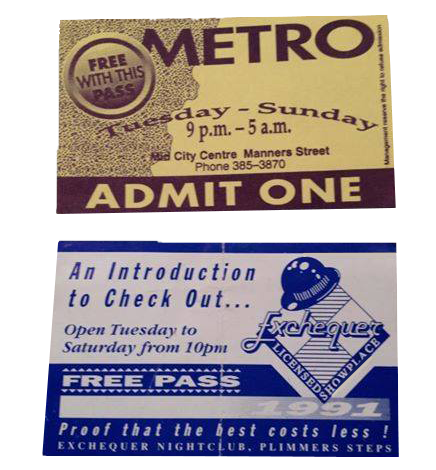 By which time, Metro and Arena were practically relics, a throwback to another time. Later in the decade, the Cambridge Terrace-located Tatou would replicate the old school 80s formula, and it would prove itself as a popular post-3am joint. But Tatou was more exception than rule, and hardly typical of the many late night bars on offer to a new generation. A generation spoilt for choice in terms of hours, venues, and genres. If none of the fledgling Courtenay sector bars were to your taste you could always seek out the infamous yet irregular Eden "raves" (of 1993 to 1995) hosted by a new era of DJ, the likes of DJ Coda (aka Leon Baldock). But that takes us well into another decade entirely, another story for another time. Johns had been forced to sell Arena in 1992, and it continued to operate under that banner until around 1994, when the purpose-built premises closed. There was a brief attempt to revive it as Arena 2000 but it wound up sitting vacant, unused, and unwanted. Metro suffered a similar fate, and there was a certain fateful symmetry in Johns and Mills each hitting the wall, at roughly the same time, for pretty much the same reasons. In a further twist, each man would return around the turn of the century, Johns with Rain on Courtenay, and Mills with Chicago Sports Cafe. Mills is still active on the bar/club circuit via his partner Gina (sister of Frankie Stevens) who runs Public. He continues to run the Saints basketball franchise, the Stuff website labelling Mills the "patron saint" of Wellington nightlife a few years back. If that’s indeed the case, then an argument could be made that Johns – who died in 2004 – was its Godfather. Each man made a massive contribution to the evolution of Wellington nightlife, or specifically nightclubbing. As did Stevens. And we can’t overlook the roles played by Pene, Bell, and Harding; men charged with documenting the huge changes in dance music trends across the decade; the emergence of house and techno from the remnants of disco and synthpop, and the morphing of funk into hip-hop and rap. And of course the steady transition from its underground origins to the mainstream home it occupies today. Coming full circle to 2014, from where your author sits – and I’d like to think it isn't quite the rocking chair you may be tempted to believe it is – Wellington nightlife now has an entirely different reality to the admittedly chrome-tinted overview I’ve presented above. Alcohol has become something of a rite-of-passage experience for many of our youth, and ongoing widespread use of both legal and illegal party drugs has changed the game yet again. Where the music might once have been important, and loyalty to venues and scenes might once have mattered, oblivion now seems paramount for a new generation. Something has been lost on the journey from the 80s to the here and now … an innocence, a degree of spontaneity, a certain DIY-approach. Something intangible or mercurial that only the 80s could offer us. The nightclubbing equivalent of a piece of number eight wire? Whatever it is, or was, it’s gone forever.